Biostar continues to flesh out its line of racing theme motherboards for gamers. The latest addition is the B150GT3, a micro ATX board that Biostar says is a "special edition release" to celebrate "30 years of excellence." To highlight the special edition status, the B150GT3 features a custom "Biostar 30 Years" logo on one of the heatsinks. Additional bling comes in the form of a checkered flag silk screen print on the PCB and customizable lighting. Users can choose from a variety of colors and effects, which are accessible through the Vivid LED DJ section of Biostar's Racing utility. Of course it's the hardware features that matter and not the additional fluff. 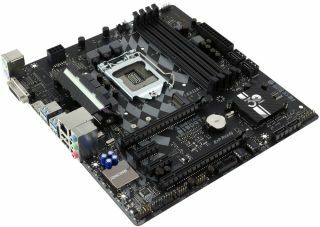 To that end, the board features an LGA 1151 socket for Skylake processors. It also has four DDR4 DIMM slots supporting up to 64GB of RAM, two PCI Express x16 3.0 slots, and two PCI Express x1 3.0 slots. You can connect up to half a dozen drives via SATA 6Gbps, plus there's an M.2 slot for those gum stick sized SSDs. Additionally you'll find four USB 3.0 ports and two USB 2.0 ports, along with a single USB 3.0 header and two USB 2.0 headers. Biostar has a reputation as a budget brand, though for this board, it trumpets high end components such as all solid capacitors, hi-fi resistors with metal oxide film and non-polarized electrolysis electric hi-fi caps for each audio channel circuit, and other bits mostly aimed at audio performance. The board also has two BIOSes, just in case something goes wrong. There's no word yet on when the board will be available or for how much.